Wake Up Early for Planets! All the planetary action this month is in the morning sky. 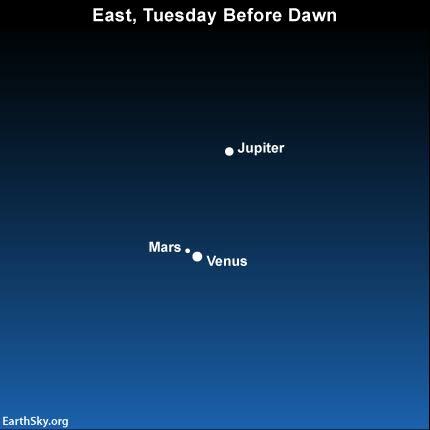 On Tuesday morning, Venus will appear right next to Mars in the eastern sky before dawn. Look for the brightest point of light you can see in the eastern sky before dawn; that is Venus. Orange-colored Mars will be right next to it. Jupiter is close by, hovering above the pair. Jupiter is very bright, but Venus is nearly 10 times brighter. And Venus is currently over 200 times brighter than Mars! The diagram below from EarthSky.org shows their relative positions. After Tuesday morning, these two planets start to separate. On Wednesday and Thursday morning, Venus will still be quite close to Mars, just not as close as on Tuesday morning. Although Venus and Mars appear to be right next to each other, this is just an optical illusion as Mars is considerably farther away from Earth right now. This diagram from Heavens Above shows the positions of the inner planets in the Solar System. You can see how Mars, Venus, and Earth all line up; note how much farther Mars is from Earth. Will try to look for those planets.